number 508 and dated 1915. (Historic Society collection). 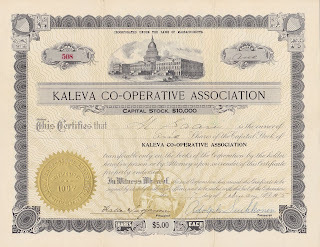 From an earlier column, we learned that the Kaleva Co-operative Association, started 1907, morphed into the United Co-operative Society of Maynard in 1921. It continued to exist to 1973. “Kaleva” refers to an ancient, mythological, Finnish ruler known from a nineteenth century work of epic poetry and story-telling compiled by folklorist researcher Elias Lonnrot. The work, “The Kalevala,” is regarded as the national epic of Finland, instrumental in fostering a sense of Finnish national identity that culminated in the Finnish declaration of independence from Russian rule in 1917. 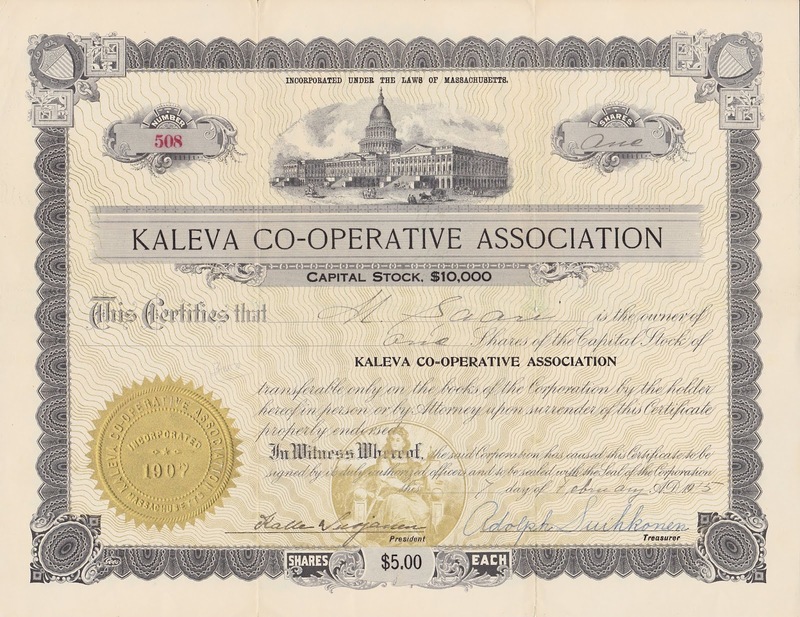 Locally, immigrants had formed the Finnish Workingmen’s Socialist Society in 1903, from whom the 187 founders of the Kaleva co-operative were drawn. According to a book, “The Finnish Imprint,” a delegation of Finnish immigrants had initially approached the large and prospering Riverside Co-operative Association with the idea of becoming members. Because many of the recent immigrants did not speak English, they asked that the co-operative hire Finnish store clerks. This suggestion was rebuffed, with a reply that if they did not like the service they received, they should start their own store. They did. The business was initially capitalized at $1,600 from sale of 320 shares at $5/share (equivalent to approximately $125 in 2019 dollars). The initial location was a rented storefront at 56 Main Street. By 1912 the co-operative had bought the entire two-story building, soon after added a bakery operation, a dairy with home delivery, and a restaurant on the second floor, serving meals to hundreds of workers living in neighboring boarding houses. share number 11837 and dated 1947. Click to enlarge. Maynard was not the only home to a Finnish-organized co-operative. Fitchburg has the Into Co-operative and Quincy the Turva Co-operative. In 1919, Maynard and these and others merged to create the United Co-operative Society of New England. 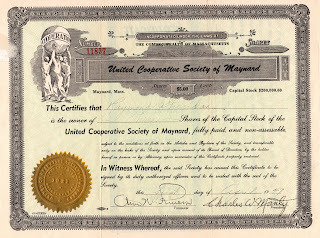 This was short-lived due to financial and political disagreements, the end result being that the Maynard group reorganized as the United Co-operative Society of Maynard, and Fitchburg becoming the United Co-operative Society of Fitchburg. The latter was the last of the Finnish co-operative to close its doors, in 1977. United’s by-laws had added an eighth principle to the previously describe Rochdale seven – continuous expansion. Over the initial 50 years membership grew from 184 to 2,960 members as coal and firewood (1924), fuel oil (1933) and ice (1934) delivery were added. In addition to the Main Street store, a branch store was opened on the northeast corner of Waltham and Powdermill Roads (1926), superseded by moving the branch store operations to a new building at the northwest corner of the same intersection (1936). This remained active until it was sold to Murphy and Snyder printers in 1957. Next door, now the Seven-Eleven/Dunkin Donuts store, was an automobile gas and service station (1934). A credit union was added in 1948. United's Main Street store, 1957. Now Look Optical and other businesses. 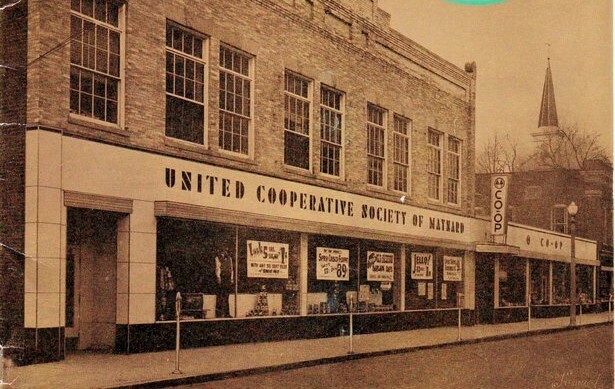 A report by the U.S. Bureau of Labor at that time stated that the United Co-operative Society of Maynard was one of the ten largest in the country, calculated either by number of members or annual sales, and was also one of the ten oldest. More than half the households in Maynard belonged to United. At its peak, the co-operative had more than 50 full-time employees, with medical benefits and life insurance – unusual for that era. United survived the competition from an A&P supermarket operating on Nason Street (in the building now housing The Outdoor Store), but the presence of Victory Supermarket on Powdermill Road, combined with the freedom to food shop elsewhere provided by increased car ownership, put pressure on the co-operative. In June 1973 that was a vote to dissolve. United's By-laws had an interesting clause: On the occasion of dissolution, which required a 3/4 majority of votes at a meeting, the assets would be used to pay the purchase value of the outstanding shares. As a disincentive to taking this action, any surplus would go to the Co-operative League of the United States rather than to members. In 1981, a natural foods effort named the Carob Tree Co-op was started in Concord by Debra Stark. It later moved to Acton, then Maynard, where it occupied a small store on River Street, then back to Acton. In addition to paid staff, members took turns volunteering at the store. Several ex-members reminisced about being part of Carob Tree, but so far there is no paper trail to document its brief existence, or the date of its demise. Debra Stark went on to start Debra’s Natural Gourmet, in West Concord, in 1989. Perhaps the failure of Carob Tree was a catalyst for her marvelous success. And now, well into the 21st century, there is an effort underway to launch Assabet Village Co-op Market. 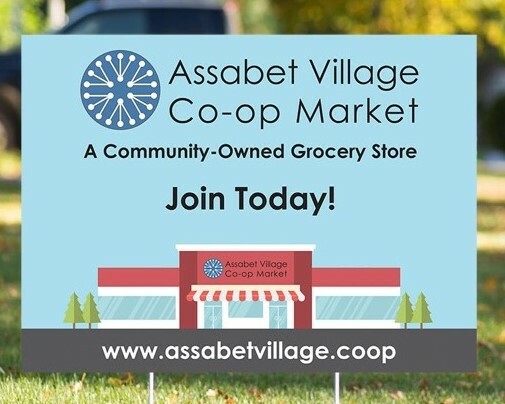 See assabetvillagecoop.com for details. The beginnings date to February 2012, when a small group of people met to discuss forming a co-op. The cost of membership was set at $200. To date, 1,055 people have joined. The near-term goal is to find and commit to a retail space on the order of 7,500 square feet, with immediately adjacent parking. Once a site is identified there will be fund-raising effort to reach the capitalization goal of about $1.2 million, hopefully achieved via a combination of local and state grants, bank loans, and interesting-paying loans from members. This is expected to take 4-6 months. Once launched, Assabet Village intends to make a point of sourcing food from local farms. And if all goes as planned, Maynard will once again be a co-operative town, 145 years after the start of the first.